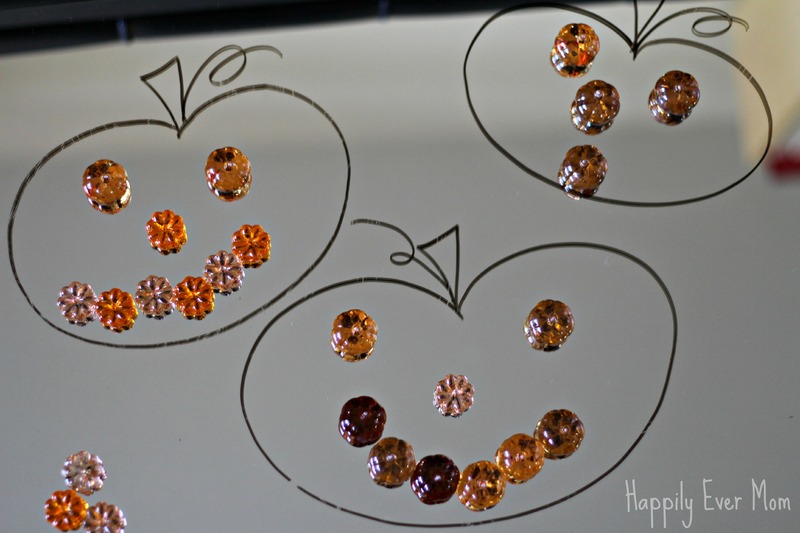 I drew three simple pumpkins on our mirror and placed the pumpkin jewels and tongs on the mirror as well. I was curious to see what my daughter would do with this. 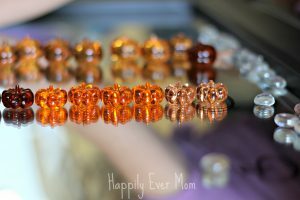 She started right away by filling up the bottom pumpkin with jewels. You can see the beginnings of her collection in the photo. She told me, “We have to fill it up, Mom!” She went to work quickly by using both the tongs and her hands to fill the bottom pumpkin with jewels. After she had filled the pumpkin, we noticed the outlines of each pumpkin. 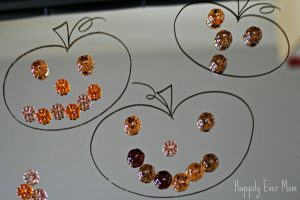 We alternated turns by placing pumpkin jewels along the line and, at one point, we saw a repeating pattern of two colors. 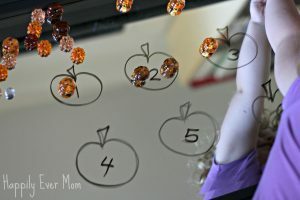 We talked about how the colors repeated, but then the focus shifted back to going around the entire pumpkin. I love little moments like those. Simple and fleeting, but such an opportunity for learning! 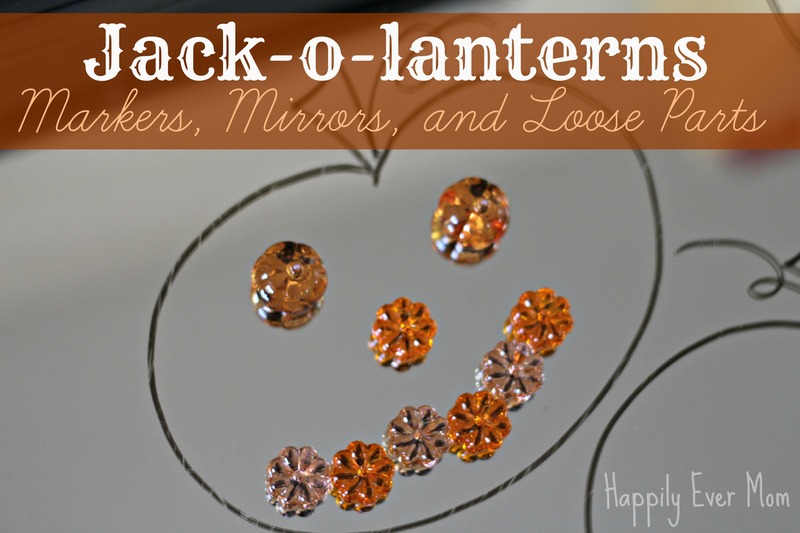 When we used all of the pumpkin jewels to make an outline, I posed the simple question: “I wonder what these pumpkins would look like with faces?” Lil got to work immediately. She made very a large smile on the first pumpkin. Next, she tried to make a “boo” face as she called it, but she got so scared that she quickly turned it into a smile! I couldn’t help but chuckle – Halloween should be an interesting night for her! I loved how sweet these little pumpkins turned out. 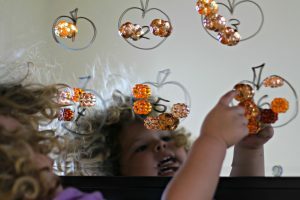 But, once Lil heard that we could erase the pumpkins with a baby wipe, the pumpkins quickly disappeared! She experimented with drawing on the mirror by drawing her own pumpkin patch. When she was satisfied with her drawing, she asked me to draw some new pumpkins. 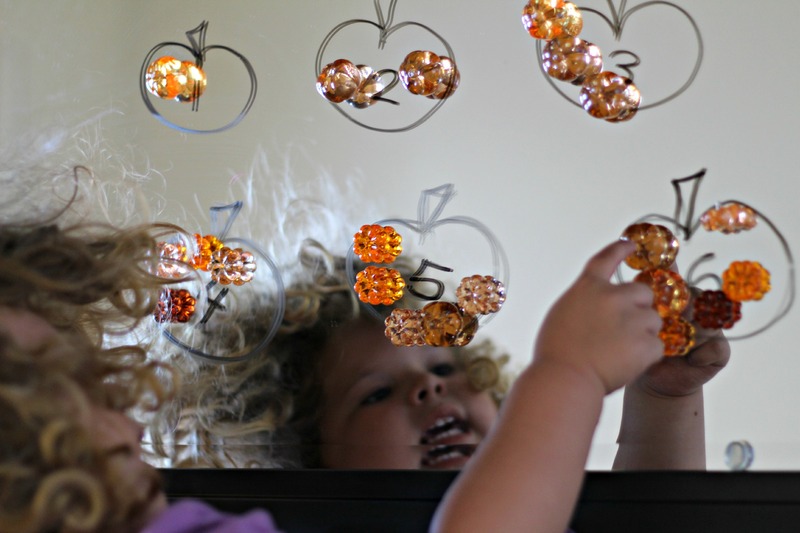 I put some numbers in the pumpkins and she began sorting on her own! She is really drawn to sorting and counting, so this was perfect for her. She counted each one to make sure the jewels represented the right number. 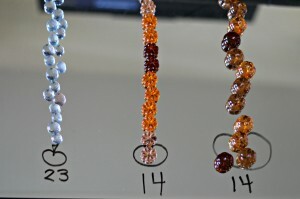 I was amazed that she “knew” what a group of jewels should look like in relation to each number. In other words, she placed six jewels on the number six without counting. Visually, she knew what a group of six should look like. Then, she counted to make sure she had gotten the correct number – and, she did! The last thing that we did was to sort our jewels by shape (the basics of classification!). And, then we counted the number of jewels in each group. 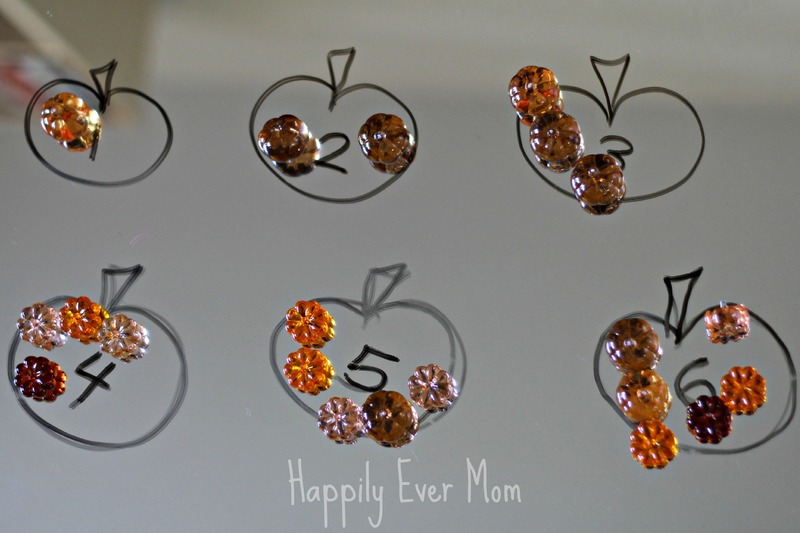 I love that she predicted that the larger pumpkin jewels (the ones on the right) would be the largest group – this is so typical of a three year old. I love watching textbook development in my own child. When I told her that the smallest jewel (the one on the left) had the highest number of jewels, she was astonished. Did I mention I love witnessing children learn?! Awesome! Our play was so dynamic. It evolved organically as we interacted with one another and learned together. 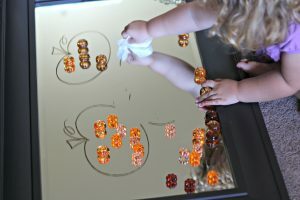 I was also able to observe Lil’s interests (numbers and sorting) and her persistence and engagement. 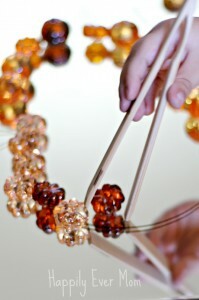 I was really amazed with how long she played with this. I look forward to setting it out again and watching how she will play differently, or perhaps, similarly. 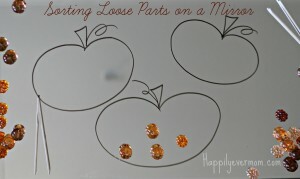 Such a simple activity yet there are so many ways to learn and to play! 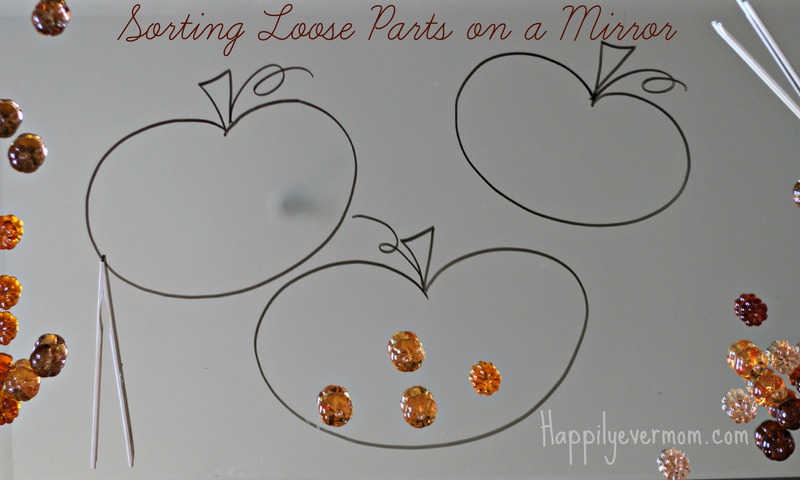 Do you use mirrors for play? Thanks for stopping by! Keep in touch by following along here: Facebook, Pinterest, Instagram, Twitter, & Google+. Great idea! 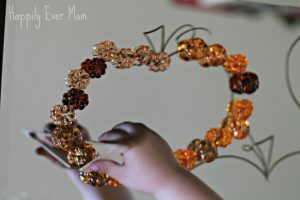 I love this, I’m totally putting this activity out today for the girls! 🙂 Thanks! PS… I love those wooden tongs! Where did you get them? Thanks, Lisette! I hope they enjoy it 🙂 I actually go the tongs at a local kitchen store in Trukee, CA outside of Lake Tahoe! But, I just looked on Amazon and they have very similar ones there – I’ll add it to the post! Sweet! I’ll have to check amazon! For some reason I always check there last and I have a prime membership so it should be a first on my list to check! 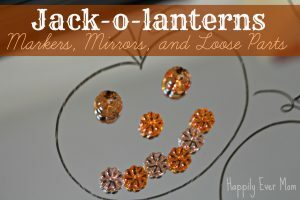 I love the idea of making jack-o-lanterns with a mirror and jewels. Thank you for sharing on Artsy Play Wednesday. This is wonderful! I love it and can’t wait to try it out :).